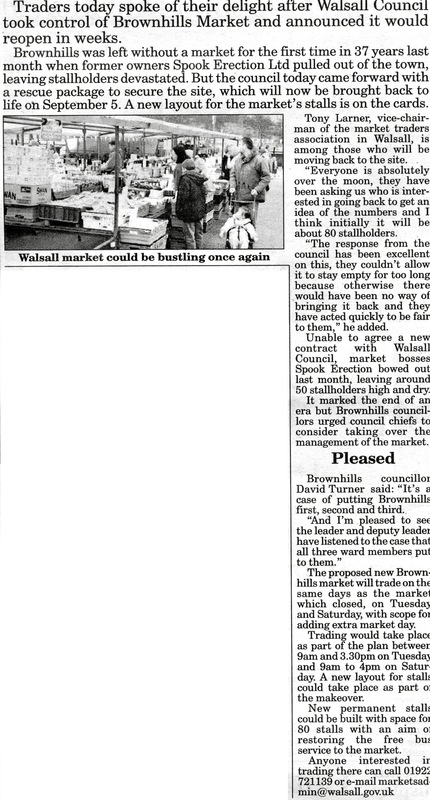 I’m genuinely pleased to see the news that Walsall Council has saved Brownhills market – at least for now, anyway. Last week I noticed workmen erecting anti-vehicle barriers on the former site and feared the worst – only the pressure of daily work prevented me blogging about it then; had I done so, I’d have speculated that nothing had come of various statements about the future of one of Brownhills’ more popular features and that perhaps the market was lost for good. I’d have been wrong in that case, it looks like it all might work out for the best in the end. According to the full article in the printed edition of the Express & Star, the market will re-commence on the 5th September, and the Council are appealing for stall-holders old and new to come forward – interested parties are requested to call Markets Administration on 01922 721139 or mail them on marketsadmin@walsall.gov.uk. This is great news – a new layout, new management and hopefully, new impetus. Since Tesco clearly seem to have bigger fish to fry than Brownhills these days, it’s nice to see that cynical attempts to kill off what was a relatively long-standing tradition failed. One can only hope that the facility is policed thoroughly by both West Midlands’ finest as well as market inspectors and trading standards, to prevent the kind of illegal bazaar that went on previously. Lets hope that counterfeit DVD and clothing pedlars get the message and are met with rigid enforcement. The article contains a few too many ‘could’ and ‘might’ terms for comfort, suggesting rumour and sigh rather than hard facts, as well as the now traditional Express & Star glaring error – under the photo it suggests Walsall market could be bustling again, which is lovely but I thought we were talking about Brownhills Market. I can’t help but wonder exactly what went on between Spook Erection and Walsall Council to cause the dispute in the first place. Despite their protestations to the contrary, it looked terribly like the market was being killed to order, and now the plan has changed. I also can’t really visualise Walsall Council reinstating free busses to the market either, somehow, but we’ll see. I really think that kind of action would be somewhat inflammatory towards those who suffered the abortive monkeying with community transport for starters… but lets see how things go, and hope that things go better for Brownhills than they have been for Walsall’s market of late. I wholeheartedly wish all involved every success, and I, for one, will be there for a damn good mooch when it reopens.If there’s not a decent sweet stall I’ll be heartbroken. Remember, if we the residents of Brownhills don’t support a revitalised market, we’ll lose it a second time – and that’ll be because we didn’t deserve it. From the Express & Star, 28th July 2009 - click on it for a bigger, legible version. This entry was posted in Brownhills stuff, Express & Star, Followups, Local politics, planning, Walsall Council and tagged Brownhills, Brownhills Market, Cheap tat, Express & Star, Local politics, planning, Redevelopment, Tesco, Tesco Development, Walsall Council, Walsall politics. Bookmark the permalink. That’s good news, Market opens the same weekend I’m hoping to move to the Venice of the North Midlands. Has to be a good sign. Great news. I felt like a little part of my childhood had died when I heard Brownhills market had closed. Many a memory of being dragged around there by my mom as a nipper. She still occasionally buys me pants from there too.